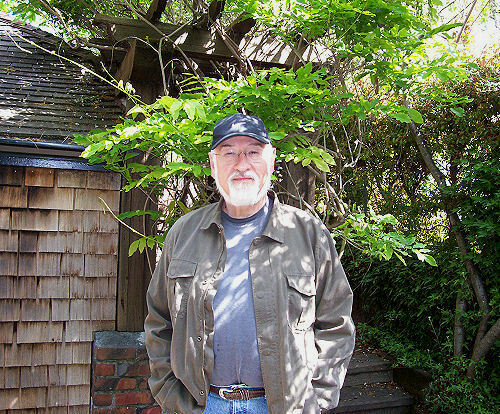 The following are excerpts from interviews with Robert Zagone by John Minkowsky in May 2008, edited by John Minkowsky and revised by Mr. Zagone. A series of conversations in that year, between Mr. Minkowsky and former NCET personnel and participants, were recorded in preparation for his forthcoming book on the important role played by three public television stations – KQED in San Francisco, WGBH in Boston, and WNET in New York – in the development of video art. The genesis of the National Center for Experiments in Television was a one-year pilot program called The Experimental Project, initiated by James Day and others, funded by the Rockefeller Foundation, and directed by Brice Howard, who also ran the Center itself. Five artists from different disciplines – painter/sculptor William Allen, novelist Bill Brown, composer Richard Felciano, poet Joanne Kyger, and filmmaker Loren Sears – were invited to spend a year exploring the medium of television as a means of personal expression. Before any actual production work was undertaken, the group met on a regular basis for several months simply to talk, and it was in this context that Howard introduced them to his notion of videospace. Transcriptions of many of these free-for-all conversations are still extant. Because the only facilities available to them were the studios of KQED itself, each of the five artists-in-residence was allotted only two days of actual production time, which they nonetheless put to superlative use, producing such important works as Descartes (Joanne Kyger) and Linearity (Richard Felciano). But, as Robert Zagone describes below, there were also periods where the group could simply go in and “play” – a means of learning the parameters of working in television. I graduated from the University of California at Berkeley in ’62 and immediately went over to KQED and volunteered. I became a producer/director at KQED in 1963. So I had this vast knowledge of live television that Brice knew about, and he felt that I was probably the perfect person to be the conduit between the artists and the machinations of the television environment. I was one of the better live television-by-the-seat-of-your-pants directors. I could work spontaneously, I could work fast, I knew the system, I knew the engineers. I was probably around 30 years old, and prior to that I had done a variety of different kinds of music shows – classical, rock and roll, jazz. I’d done documentaries; I’d worked in film as well as in live television. For everything that was done in the first phase, I was the director, the liaison, the conduit, the technical artist to translate the work with the artists and get it down on tape. I was on leave to work full-time with the National Center for X number of months. I don’t even think it was nine months. The issue was, how do you take these disparate artists who have no knowledge of the television environment – they do not know the language – take their artistry and translate it into what Brice Howard termed videospace using this huge television machine? And you have to remember, at that time it was a union house; no one could touch the equipment other than the studio engineers. The engineers were not creative people, not unlike today; they were strictly by-the-book engineers. So they needed someone to translate the thought process of these artists into the television medium, and that’s where I came in. We would get together and talk and Brice would get over his concept of videospace, and then the artists would think about it. And then one of the first days of playing, which we used to call “playing in the studio” – and this was nothing for broadcast – we did a piece called Feedback with the dancer/movement artist John Graham. And there was someone in the Art Department named Bill Jones, who did sets, and he was adept at doing wardrobe too, so he was able to dress John in an outfit that was more conducive to feedback. The cameramen were totally clueless as to what was going on and that’s why they needed me. The technical director that I worked with was a gentleman by the name of Walt Bjerke, and he was kind of a curmudgeon, very, very tight on union rules. But he and I got along, he was able to understand, and he was usually my technical director on shows. He figures importantly in this because a lot of the visual effects you see – like in Descartes – that was Walt and myself. Because none of the artists could touch the equipment, they weren’t able to come up with these visuals. One of the pieces I was involved in was Linearity; I was television director on that working with Richard Felciano. And although a lot of people want to talk about: Oh, it’s just spontaneous and playing…Well, no, we structured it out. We had a shot list and worked from a score, and it was not something that was cavalier in its approach. The most successful piece in my estimation was Descartes, and that Joanne Kyger and I did. We did it three times and it was take three that we liked. And here’s where the technical aspects of the KQED studios came in. There was an old switcher that they had, and it had a clipper on it – a clipper was akin to what would be used now as controlling the video – brightness, getting the picture right. But this was an old switcher that had a little knob on it. So what we did – Walt Bjerke and myself – when we did the feedback with Joanne when she blossoms like a phoenix, we ran that clipper way up, and the feedback was so intense it fluttered. Now, you probably can’t do that anymore. You could probably do it digitally, but you couldn’t do it mechanically anymore cause modern day switchers don’t have that ability. I also worked with Bill Allen on a piece he did with Robert Nelson called War Is Hell, and it was more of a legitimized dramatic presentation that they did in the studio. It was all scripted and worked out, we had shot lists, we had sets and actors, and I was the television director for that. But it was Bob Nelson and Bill Allen’s concept. I worked with Phil Green on a thing he did called Golden Gate, where Bernie Stauffer did a sound montage of the Golden Gate Bridge and Phil shot some footage. Phil was a great cameraman in the Film Department, and he just came over and did a guest appearance. I think he was curious and I think he knew Brice from the NET days and asked to come over and do something. Then there were other playful things that we did early, like Suzanne, Oscilloscope, and Sorcery, the last by Loren Sears. And that was part of the play in those days. West Pole was made after I left [the Center]; I believe it was before ¡Heimskringla!. It is an ultimate use of videospace; I did things on that show that were never done at the National Center. I give credit to the Center for the ideas and concepts in the show; West Pole was a definite springboard from things that I had learned and played with. It was essentially an essay about the rock and roll groups in the San Francisco Bay Area. And we had two performances, by Ace of Cups and the Sons of Champlin, in the studio, which were done in videospace style. And the camera people were a couple of maintenance guys and a guy who wasn’t a good cameraman. But I didn’t need a good camera; I said, “Just hold that shot” and “Everything’s live.” It’s what I created [in the mix]. For example, in the Sons of Champlin, what I did was I took the videotape, put it through the heads of one machine, continued it over to another machine [for tape delay]. I had the prospect of using real time, past time, melding the two and creating a collage of images. As a matter of fact, it got so intense it blew the sync. ¡Heimskringla! was a painful production. It was pretty much of an unmitigated disaster, although it did get a pretty good write-up by Terence O’Flaherty in the San Francisco Chronicle, [who] liked the experimental nature of it. But there were a lot of problems with putting that piece together. We didn’t have much time; we were at Stage A in San Francisco where we shot and edited it, and that’s in the 22nd Street and Portrero area. We had five days to do it, and we had to be out on the fifth day because another show was coming to Stage A. And it was virtually impossible. And on the last day we edited and we had two machines up there and we literally worked 48 hours straight. It was a production where we did it by scenes and then we put the scenes together. But within the scenes, it was a live mix – I mean, there was no other way. Today you’d be able to do layers and layers and get an image that you want. I mean, even in pre-digital days you could still do chromakey. We were doing keys, but not chromakeys. Another of the problems was that, when we did things like Descartes and Linearity, we were working from the old switcher at the KQED studios, and we could do certain feedback techniques like no other. I knew there were certain technical elements in the studio and the control room that we could destroy and break down, and out of that would evolve some interesting imagery. We weren’t able to do that at Stage A, because we were using the clipper from the remotes. From my point of view, it didn’t have the visual élan that I had hoped for, and for me it was a failure. But an interesting experimental failure and a worthy effort, and it did open the door for other ventures into videospace. It was fun to work on. It was grueling but fun. But I was so deeply close to it that I can’t be objective about whether anybody could ever watch it from beginning to end. There were problems with the script, and I remember Tom O’Horgan, who was the director of Hair, Jesus Christ Superstar and Lenny – great guy to work with – was having problems with Paul Foster, who wrote the script. They were good friends, but they were arguing all the time. Tom felt it wasn’t ready for production. And the actors from La Mama were a frothy troupe of players, and they all had their ups and downs. You never knew if they were coming in depressed or coming in jubilant. But they were great actors, great fun. Tom O’Horgan was the theatrical director who worked directly with the actors. I was the television director, and the special effects. And then I didn’t even want to take credit on it, but Tom insisted that I take the videospace mix credit, which was decent of him. I think probably at the time there’d never been anything like it on TV, where you would have to pay attention. In retrospect – and I haven’t seen it since it was done – I think it would be pretty pedantic now, pretty tame, and not very interesting. But at the time no one had been putting actors in videospace. Well, of course now with music videos, that’s done all the time, taking musicians and putting them in some kind of errant space, some kind of videospace, but that was the first time it was done. So it’s a kind of interesting amalgamation of acting and video technical artistry. I don’t think it was very successful, but it was what it was. It probably would have been better to do something less ambitious. I don’t think it was well received by the network at all. The network tended to ghettoize any shows that came out of San Francisco. They couldn’t understand them and they didn’t know Jefferson Airplane from American Airlines. And so it would run at like 12 midnight on Saturday when no one was watching back then. And I think they ghettoized ¡Heimskringla! too; I mean, I don’t think they appreciated it. It was done specifically for NET Playhouse. Jac Venza was the Executive Producer and I’m not sure he ever came out of the shock. And they were like: Let those crazies do what they have to do and let’s not get involved. But I was always disappointed – maybe it’s because of my own dramatic narrative interests – that the Center didn’t move more in that direction. I knew Paul Kaufman when he was a producer, along with Brice, from NET. And when he was the director of NCET, I was called in on a freelance basis cause they wanted to do a pilot of Ernest Callenbach’s Ecotopia. There were technical problems here too. Some of it we shot out at a rural woods type of scenery and the footage didn’t come out very well. And again, it was one of those noble concepts that wasn’t thought out entirely. Callenbach’s book is really interesting but I don’t think at that time it was translatable to a dramatic narrative. If it was, it would have been made into a TV movie by now. But I was not involved in any other of the Center’s dealings, except for working as television director for Willard Rosenquist, who I loved, to do Lostine. It won an Emmy. I don’t think there was ever any great embracing of the National Center by KQED. There were a lot of people at KQED who had no insight as to what was happening culturally. KQED was very liberal in the ‘60s; starting in the ‘70s with the Nixon administration, there was sort of political intrusion on the shows. You couldn’t do any show about Vietnam, you couldn’t say it, you couldn’t mention it. That’s when everybody saw the handwriting on the wall, and we were gone. And it was the right thing to do. And it was about this time, after I did West Pole and ¡Heimskringla! and I did my rock and roll specials, when I left. I went to Fantasy Records and made films there with Irving Saraf [Academy Award winner for Best Documentary Feature, In the Shadow of the Stars, 1991] and Ralph Gleason. I did some music videos while working at Fantasy, e.g. Creedence Clearwater Revival. After leaving Fantasy Records, I did a variety of freelance work, including music productions (rock and roll, jazz concerts and festivals, etc. ), documentaries (Inside the Cuckoo’s Nest) and directed a slew of corporate videos – visionary productions as well as dramatic pieces that introduced new products or high tech concepts. In the early ‘80s, I drifted to directing dramatic narrative. I did my first independent feature entitled The Stand-In, starring Danny Glover. The film was produced through the auspices of the Bay Area Video Coalition with a grant from the Rockefeller Foundation. Afterwards, I did an award-winning drama, entitled Term of Trial, a drama based on the case history of parallel couples: one that is at risk of having their first child, and another couple that already has several children. Through a series of medical mishaps, one of the couples has a birth that leads to the delivery of a brain-damaged child.